Villa Esmeralda is a spacious 5 bedroom villa with a large swimming pool making it a great addition to our Very Villa Plus programme. Perfect for large families and groups this villa is a stone's throw away from a good choice of shops and restaurants. The centre of this much-loved resort of Corralejo is within a 10 minute walk. Here you will find a beach and a good number of shops and places to eat. WiFi, pool heating and air conditioning/heating in all bedrooms are included. A spacious villa with a large pool! Plus, the centre of Corralejo is within walking distance! You will love Villa Esmeralda! Outside is the large private pool is dotted with sunbeds and has Roman steps for an easy access. Next to it is a poolside shower and a covered terrace with a table and chairs and BBQ - perfect ingredients for dining alfresco on those balmy evenings. Walking through the gate up the stairs, the front door is ahead. There is on street parking for your hire car. The spacious open plan lounge/dining area is divided into two. The large windows and patio doors provide plenty of light into this room. Here you will find sofas, table and chairs and flat screen TV. From here the patio doors lead to the covered terrace and pool area. The kitchen is fully equipped with all the modern appliances and has a door leading to a utility area. There are 5 bedrooms in total in Villa Esmeralda. One of the bedrooms is a double bedroom with an en suite WC. Adjacent is a shower room. One of the twin bedrooms has an en suite shower room and patio doors to the covered terrace. Next to it is a large twin bedroom and a further twin bedroom with patio doors out to the side of the villa. Next door is a separate bathroom. 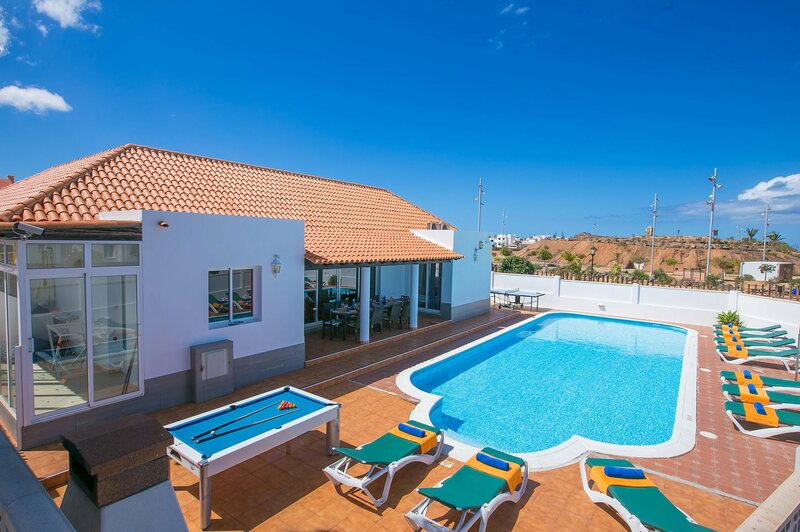 This impressive villa is located a 10 minute walk from the lively Corralejo resort centre. Here, you will find a good choice of bars, shops and restaurants including El Campanario Shopping Centre, which has a more traditional feel with live music while you shop. The beach of Bahia Real is also within a walking distance. The stunning beach of Grandes Playas and the world famous sand dunes are just a short drive away. A mini market is within easy reach on foot for any essentials you might need. Corralejo has a weekday market on Mondays and Fridays, with a weekend market at the nearby El Campanario Shopping Centre. Las Palmeras Shopping Centre is also within walking distance or just a short drive away and is ideal for anyone wanting to enjoy a bit of retail therapy! The lively main promenade leads through the music square where you can often find live music playing as you shop. There are restaurants within walking distance from the villa. Corralejo's main promenade, which is 10 minutes' walk or a few minutes in the car has a good variety of restaurants. Enjoy lunch at one of the tapas bars, which have typical local food from the island. Or, by night enjoy the live music venues and eateries near Waikiki Beach with the views out to the ocean. At Corralejo Harbour you will find good quality local restaurants. The closest beach to Villa Esmeralda is Bahia Real, which is within walking distance. Galera Beach is in the centre of Corralejo. The stunning beach of Grandes Playas, which is famous amongst windsurfers is just a short drive away. Acua Waterpark in Corralejo offers a variety of water slides and tubes or you may choose to venture in to the wave pool or the lazy river! You can even try your hand at crazy golf which is also located at the Acua Waterpark. There is another crazy golf course situated at the Plaza in Corralejo, whilst there are 2 excellent courses at Caleta de Fuste, open to visitors and operated by the Barcelo Hotel, along the beach and promenade. For those wanting to explore more of what the Islands have to offer, it is 15 minutes' ferry from the harbour to the neighbouring island of Lanzarote, docking at the popular resort of Playa Blanca. Fuerteventura's former capital, Betancuria lies in a picturesque valley next to a dried up stream, which flowed up until the 16th century. The Centro Insular de Artesania, next to the museum, documents traditional arts and crafts - if you want to see some local handicraft this is the place to come! Make a visit to the Casa Santa Maria where you can watch local artists at work and even purchase some of the handmade products from the quaint local shop. If you fancy a game of golf, Mirador de Lobos Golf Resort in Corralejo is located within driving distance. If you prefer a larger course, there are other golf courses to be enjoyed in Caleta de Fuste located on the East Coast just after the airport. Kites are available in many shops in Corralejo. The expansive sand dunes and golden beaches are perfect for kite flying. Alternatively, you can try the go karting track in Puerto del Rosario. Smaller karts are also available for children. Hiking tours are arranged by the local council and full information can be found in the tourist office in Corralejo. Villa Esmeralda is not available to book for season as it is sold out. Take a look here at the Fuerteventura villas that are currently on sale. The strong surf around some parts of the island make Fuerteventura one of the best spots in the world for surfing. The reliable winds and a variety of water conditions mean wind and kite surfers have all they need to enjoy these activities. There is surf to suit all standards of surfer from the novice to the most experienced and adventurous surfer. Lessons are available for any of the disciplines at various centres around the island. Various watersport schools can be found throughout Corralejo and on Flag Beach, all of which offer instruction, sporting equipment, wetsuits and transport for body boarding, sand boarding and surfing. Ask about their clubs for children. Schools are also available in Caleta de Fuste at the watersports area in the harbour beach. Brilliant villa and experience, could not fault it what so ever. Would definitely recommend to everyone. Would certainly use company and villa experience again. Brilliant, brilliant holiday. We had a lovely holiday and could not have asked for a better Villa. Fantastic villa holiday. All the little extras were well appreciated. Already looking for villa plus next year. Another fantastic holiday - this villa is located in a good position and is within easy reach of the local restaurants and shopping areas yet maintains its privacy. We found it to be clean and well maintained - will be going again soon. Keep it up Villa Plus! We loved our stay at Villa Esmerelda, very spacious and huge pool. Close enough to walk to main strip and beach, about 20 mins. The Villa Plus package was great and all ran smoothly, will definitely be returning.